thetreasurechestusa has no other items for sale. Seat of 5 clear Etched Flower leaf Design Wine Glasses & crystal goblet. Vtg Set (2) Etched GLASS SUGAR BOWL & CREAM PITCHER Creamer Daisy Flowers EVC! Elegant Etched Clear Glass Crystal Creamer Flower Floral Jug Pitcher ABP? 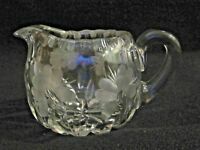 Elegant Etched Crystal Clear Glass Creamer Flower Floral Cane Pitcher ABP? 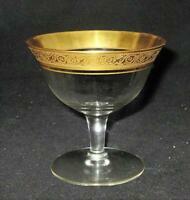 Tiffin Franciscan MINTON Gold Encrusted Optic Sherbet or Champagne Glass, 3 3/4"
Vintage Antique Handblown Etched Cut Grapes Cordial Liquor Crystal Glass - Nice! Fine Vintage Cut Glass Stemware. Lovely 8oz., 12 Piece Set.